We are all settled in our new home. My favorite room in the house is the kitchen. It's gets the best light. 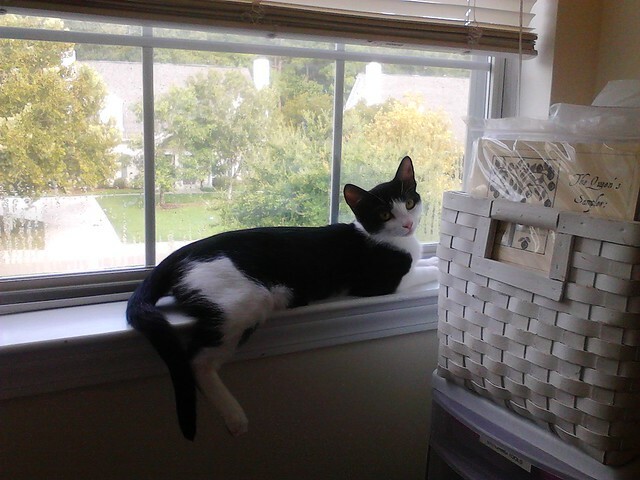 Oreo likes the new house too. She loves to look out all the windows. Speaking of stitching, I started something new (again). Shepherd's Bush "Eve's Garden." I love the bright and cheery colors in this design. Your new house looks so nice, Nicole! I love the bright kitchen, and the nook for your stitching is wonderful! Oreo has really grown! Wow! And Eve's Garden -- so pretty! I need to get to this one. Congratulations on your new place... I love your current WIP very pretty. Hope the boys have a great school year! Your new nook is beautiful, especially with Oreo watching over all your lovely stash! Congrats and hope you are enjoying settling in. Lovely home-so fresh and bright. The new piece is really pretty. Glad you are moved in, and getting things organized. Your stitching corner looks great! Love the baskets with your different patterns. Nice progress on your A&E sampler too. Your new house looks wonderful. Such a nice bright kitchen and that alcove is perfect for your stitching things. You are so organized!! Wonderful start on Eve's Garden - that's a beautiful sampler. Glad you are back where you want to be. 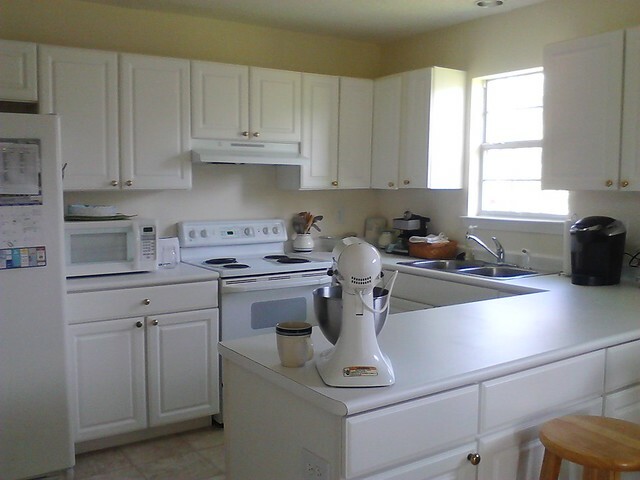 The kitchen is nice and bright & perfect for baking. I do adore how you have your stitching organized...perfect!! Love your new home! And I wish my stitching stuff would be half as organized as yours...guess I should work a bit on that. :) Great start on Eve's Garden. The colours are beautiful. Oreo looks VERY comfortable in the new digs so that says a lot ... enjoy and that kitchen looks fantastic!!! Your stitching is always an inspiration. 3 Oh what a beautiful, bright Kitchen. You've got it all in order girl...food, stitch and kitty !! Love it all. Your SB piece is beautiful. Cherie and I are getting ready to start ours. She doesn't know it but we're doing a SAL. Blessings to you in your new home! We just moved ourselves to North Carolina. I am still getting settled. 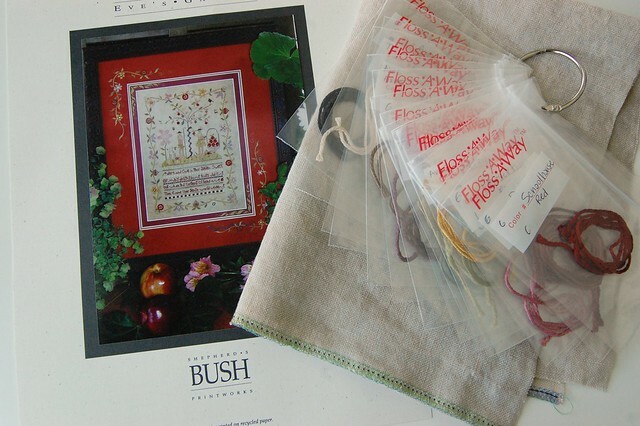 Your stitching room looks perfect! I too love your beautiful new home!!! 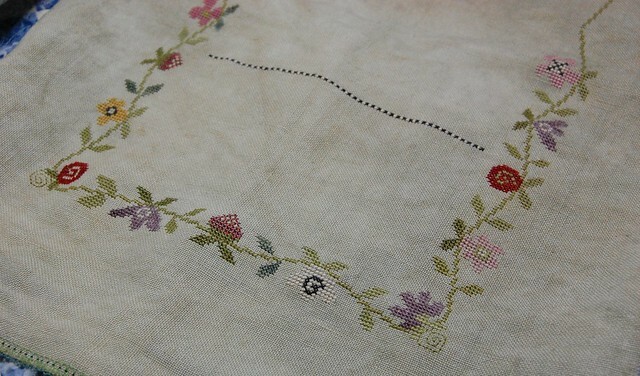 It is so light and pretty and I really love your area for stitching too. I am so happy that Oreo loves it there too!!! Is your new home a house or a condo? Either way it is just gorgeous!!! Oh I forgot, I too have Shepherd's Bush Eve's Garden in my stash. I am going to love seeing your progress on it!! Good to see you back. Love your kitchen! Glad you are getting settled! Your kitchen does look bright and cheery :) So does your new start! A girl after my own heart! Both a Keurig and Kitchen Aid on your counter - my two favorite appliances. I love your start on Eve's Garden, its a fun stitch. I started right in the middle with the tree, Adam and Eve. Oh maaan! Girl! that kitchen is gorgeous!! 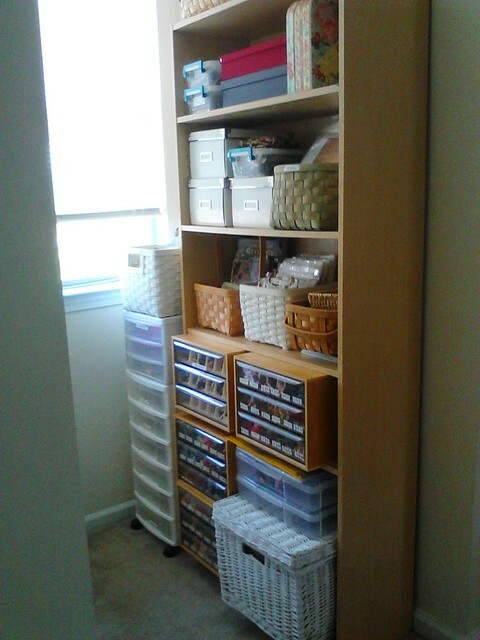 And you're just like me, everytime I move I gotta get the crafty place set up, that and my books! FIRST things first! LOL Your progress on Eve's Garden is really coming along! Can't wait to see more!! Lovely kitchen. Glad for you that the moving is done. That's always such a chore. I like your little alcove. And of course your new start is just lovely. Love your bright new kitchen and you nook for stitching stash. Enjoy your new home! I can't believe how in order and organized your home is already! The new start has such a pretty border. So excited you're back! Nice kitchen....would look even better with a live-in chef! Sure sounds like everybody is settling in nicely!! Oh! Your house is fabulous! Love your stash alcove! I have SB Eve as well and have fondled it several times...that linen is to just die for and the threads! I'm going to have to cave and start mine too! Happy Back to School time to you and your family! You are such an enabler! I want to start on that sampler just as soon as I finish Sail Away. Your new place is so pretty and bright! Love the kitty too. Holy Cats, Oero has gotten big; I love the fact that the kitchen is clean...mine isn't right now and wish it was...have a great week! Your stitching is all so beautifully organized! I am impressed. It makes me want to find some good looking storage to put all my things in one place. Your new WIP looks very pretty. Love the new house...so clean and bright with all that white. Looks like you found a great little area for your stash. A&E is cute...the SB one just looks like so much fun! That little stitching alcove is cute! And your kitchen looks lovely and bright! It must be a joy to cook in there. Oh my goodness, I love how bright and clean your home is! :) So lovely.. and Oreo is a sweetheart! Btw, I do believe after seeing your Eve's Garden, I'll need to purchase this when I'm at SB next month! It's so pretty, Nicole! Light and airy. I know you guys will be happy there. I can tell Oreo already is! Your stitching alcove is so organized! Your new home looks lovely and bright. Your stash looks so well organised. Lovely new start, I agree the colours are very bright. So happy you are all settled in, love your stitching spot. Sweet new start too. Hi Nicole, will you be at The retreat? I love your nook! And your kitchen is so nice and bright - love that!! I'm glad Oreo is adjusting and the boys are too. Great new start - so pretty! Everything is so neat and organized...perfect! Eve's Garden is a beautiful design by one of my favorite designers. You kitchen is big and light, just perfect. Good to see you have your priorities right and have the stitching corner all set up, lol. Very pretty new start. Love your kitchen but I especially love your organized stitching stash! !